Kayla watering newly seeded garden bed, five feet wide. She is standing in between beds on leaf mulch pile that we will place on the bed after the seeds sprout. In South Texas, we can go for weeks, or even months, without a single good rain. To survive, your plants depend entirely upon you for their water, and it helps to know how much and how often to water your garden. The water needs of a garden can vary greatly in the extreme weather conditions of South Texas. The key to knowing when to water is to check the soil. Ideally, the top five or six inches of soil should remain moist at all times. This top layer of soil is where most of the healthy bacteria and micro-organisms live, and they require even moisture to thrive. The garden dries out from the top layer of soil on down. Use your finger to dig into the garden bed to check the amount and depth of moisture around the plants (see pictures below). When it is time, water the soil slightly deeper than the lowest level of the roots. Watering past this point is simply wasting water. Let the soil mostly, but not completely, dry out, before watering again. This deep and infrequent watering promotes vigorous root growth by forcing the roots to reach into the soil seeking water. It is best to water the soil, not the plants. In fact, most plants, like tomatoes, don’t like water on their leaves, which causes the leaves to turn yellow and wilt. Use the rain setting of your garden hose to drench the soil at the base of your plants, but not the plants themselves. If possible, water the garden in the evening. Plants do a lot of their growing at night, and they need plenty of moisture in the soil to optimize their nighttime cellular functions. If you water during the morning, or even worse, at mid-day, you will lose a lot of water to evaporation and leave the soil dry during the night. To prevent the soil from quickly drying out, add a thick, insulating layer of native leaf mulch around your plants. A thick layer of native leaf mulch can reduce the water needs of your garden by up to fifty percent. 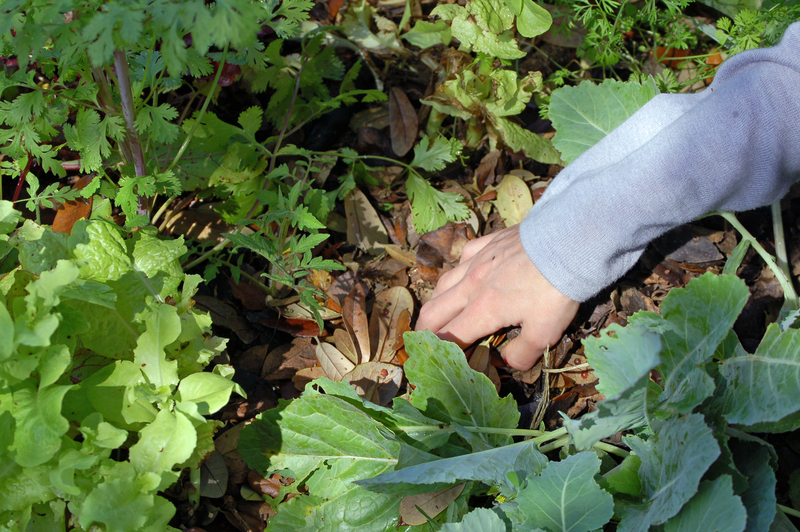 As you dig into the soil to check the level of moisture, carefully observe the plants in your garden. You will quickly see the relationship between the health and appearance of your plants and the level of moisture in the soil. Your soil will tell you exactly how much, and how often, to water your garden. Checking Soil Moisture, Step 1: Companion Bed with tomato transplant center left, cilantro far left, lettuce lower left, kolh rabi to right. Live oak leaf mulch. 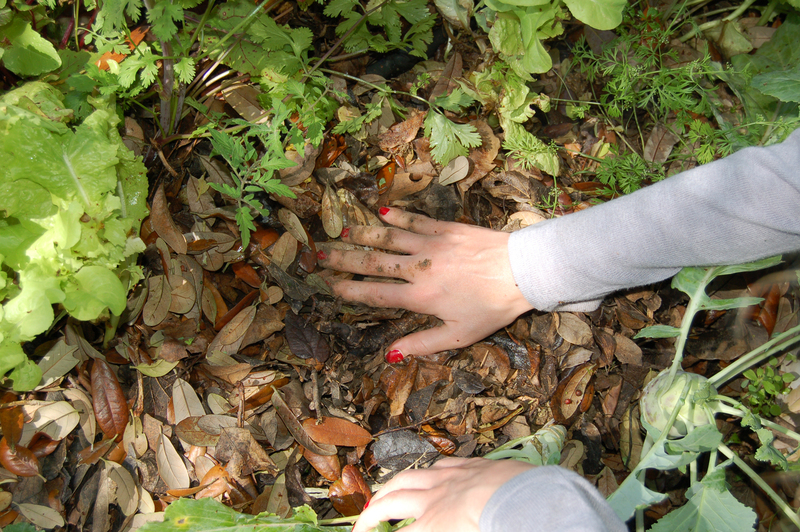 Step 2: Dig finger 5 to 6 inches into bed to check amount and depth of soil moisture. 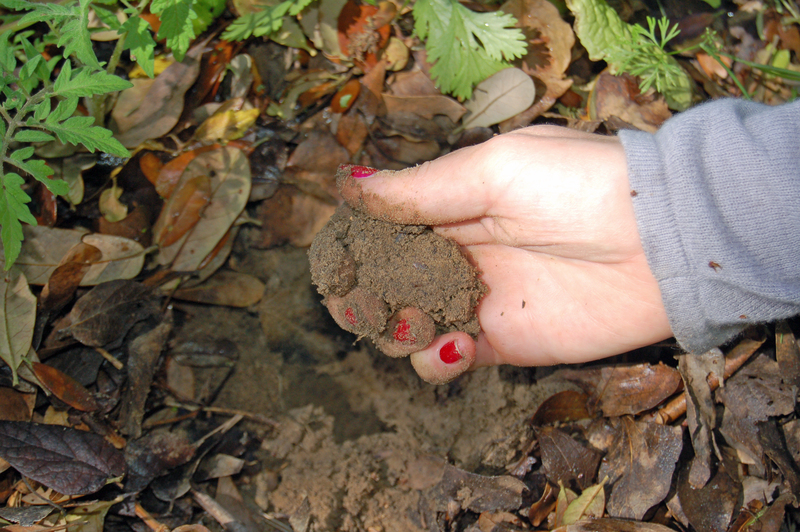 Step 3: This is day after a good soaking rain, soil is still wet–holds shape in a clump. No need to water today. 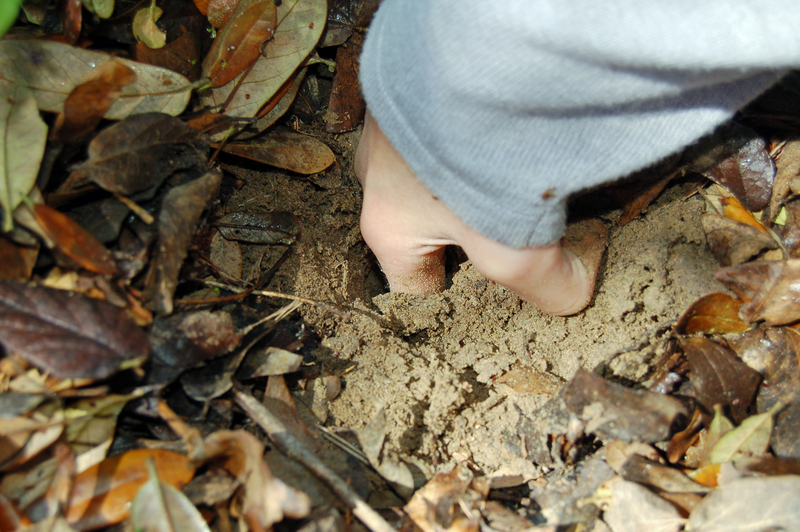 You do not need to remove soil from the hole to check moisture, this handful of soil is for illustration only. Step 4: Gently replace any soil and re-cover with native leaf mulch. I didn’t know that about the microbes and such being in the first inches of soil. But I did know about deep watering, because of trees. The garden guys on Houston radio are just insistent about that. Deep root watering and feeding is critical, unless you want your tree’s roots coming up to the surface for moisture. I’ve never mulched my pot plants, but there’s no reason not to, as far as I can tell. I did finally figure out that cactus and such do better in clay pots, and some plants that like high moisture levels prefer plastic. Oh – a story (though not necessarily a recommendation). A dear friend is not gardener, but she likes green and blooming things around. So, every year she goes to a good nursery, gets one of everything that appeals to her, and takes them home. She puts them roughly where she wants them, and then waters them once a week. When she figures out which plants will accept her level of commitment and thrive, she goes and buys more of them. I love your friend’s strategy for planting! More of us should do exactly that–go out there and plant what we love and then keep planting what works! Your potted plants would probably love some mulch. Wind and heat can dry out the soil of a container in a few hours. The problem with plants in containers is that they get hotter or colder than the ground, because they do not have all of that ground around them to insulate them. Even worse, potted plants hot very quickly, and cold very quickly. The roots of plants can tolerate a certain level of extremes, but roots can’t tolerate the stress of fast temperature changes. That is the main reason tomato plants in containers usually stop producing fairly early in the heat of summer. Clay pots insulate the soil better than plastic, and are better containers for plants.